I’ve been to a few bridal showers where as a game we make wedding dresses out of toilet paper. What we come up with is no where NEAR the quality of these toilet paper wedding dresses. I can’t believe toilet paper is in some of these dresses. These little things have been my contribution to a couple of pot lucks. Everytime I make them, I have to dig up an old journal entry (I originally got it from a magazine when Sean was having his foot surgery. I didn’t write it down, but it looks like that magazine is “Taste of Home“). That requirement ends here! Shape into little balls and place them on baking sheets or plates lined with wax paper. I typically make them slightly larger than bite-size, roughly 1 1/4″ in diameter. Refrigerate for an hour or until firm. Sometimes I will pull them out after a half hour and reroll them when they can better retain their shape. Melt the milk chocolate coating (I use a double broiler). Refrigerate for 15 minutes until the coating sets. Place the white chocolate bars into a ziplock bag (ideally near a bottom corner of the bag) and microwave it for 15 seconds. If I don’t have white chocolate, I use extra milk chocolate for the garnish. Take scissors and and snip off a tiny, tiny, tiny piece of one of the bottom corners of the zip lock bag (ideally the corner closest to the melted chocolate). Looky here! An instant pastry bag! 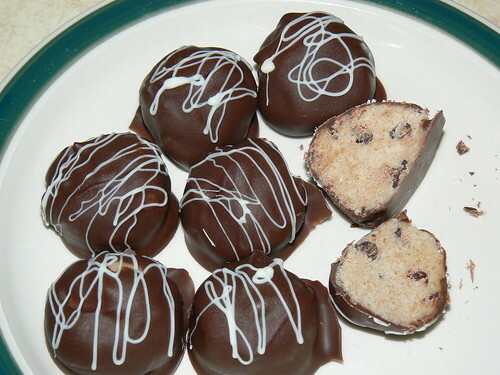 Drizzle the white chocolate over the truffles. I’ve found you don’t need many artistic skills for this step– anything tends to look neat. Place truffles back in the fridge for 5-10 more minutes until the white chocolate sets. There is a saying that “Practice Makes Perfect”, but there should be a caveat that the practice needs to be meaningful. I think this was displayed quite adeptly last Wednesday at Gwyn’s 3rd Birthday Party. Gwyn’s mother was on a business trip, so that left Grandpa (aka Larry) in charge. Almost immediately Larry encountered an obstacle. 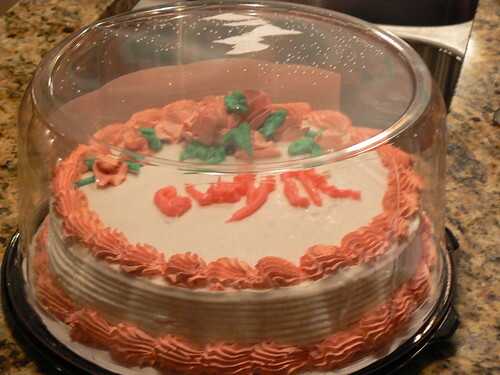 Dairy Queen forgot to decorate the festive ice cream cake with Gwyn’s name. And it turns out the teenage males manning the store never pursued on-the-job training in cake decoration. 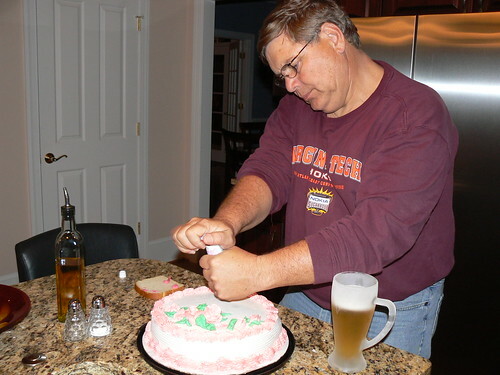 Larry decided to personalize the cake himself. He stopped by the store and picked up some pink icing. 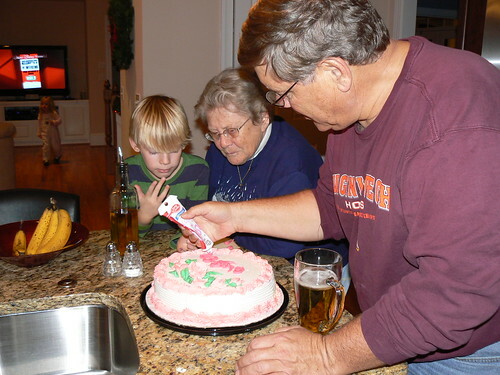 He squeezed icing over the cake and proceeded to scrawl blobs that were only slightly reminiscent of letters. Here is a picture of the cake’s first letter. Now I didn’t notice this until I was already home. Look at the practice bread in the background. What is supposed to be a G on the cake. The practice bread is in the background. The cake quickly became a group project. A knife was used to try to shift icing around and consultants were brought in to supervise. Even with everyone’s involvement and advice, the “GWYN” looked like it was written by Gwyn herself. Good thing we had that practice bread! 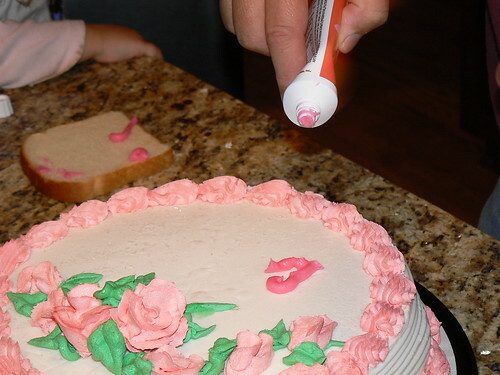 Luckily, there a little known secret about decorating cakes for three-year olds. Exclusively just for you, I’ll share. Three-year olds are not concerned with legibility of icing. They just want to ingest it! Gwyn was as pleased as she could be with the pink scribbles. 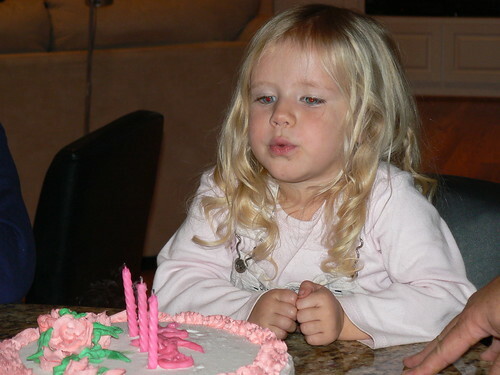 And unlike last year, she knew exactly what to do when the candles were lit. A web-based version of Boggle. I found this quite addictive at 2:30 in the morning Saturday night. Last week, I worked on-site at a factory for one of the most profitable companies in the world. Most of the users still used Office 2000. I had not seen that for a while, but from my experience, the larger organizations do tend to be slow on software upgrades. So that did not stick out to me as unusual. But I did find myself surprised in an unlikely place– the restroom. The toilet paper definitely caught my attention. Its one-ply sheets were very thin and prone to break easily when you tried to pull the roll. At the same time, it was very un-fabric-like; it was rough. And I’m not talking bad about this company behind their back. It took me two days, but I shared my observations with my hosts and they had to agree (how could one argue?). Of course, opening the toilet paper topic did prompt an awkward moment. At one point, one of the trainees was telling me about a different organization and she used an analogy. “They go through [engineers] like you go through our toilet paper!” she declared. The last weekend in September was “Take a Child Outside Week” (and actually, I’m sorry to admit I did not know that week existed until one Ryan Somma alerted me). Of course, I was traveling most of that week, but on the very last day, I took five-year Penn out for a quick hike in celebration. I choose Poverty Creek as our destination and as we drove there, we saw a black bear running along Forest Service Road.